Affection Collection, new cat app for iPad: image by Annette Dew via news.com.au If you haven't purchased an iPad yet, let me ask you one question.... Do you love your cat? Then there's no better reason to buy an iPad than the new iPad app for techno cats called The Affection Collection. Don't worry; the app is free! 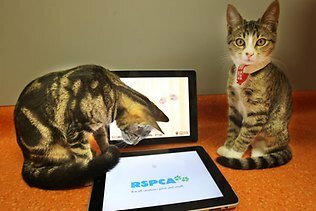 Developed by student Saxon Cameron at Bond University in Australia for the Royal Society for the Prevention of Cruelty to Animals (RSPCA), the iPad app contains three different cat games... so far. Though there are not a lot of cats that are techies yet (cat nerds? ), you can develop a techno cat in no time just by placing your iPad on the floor and playing the games yourself. The moving mice and strands of yarn on the screen can't help but get your cats hooked. And for multiple cat families, the cats can all play on the same iPad, not to worry. This video, produced by ABC network in Queensland, will show you how even kittens get the knack! And get a load of all the special features this app has, like auto-shuffle! A spokesman for the RSPCA, Michael Beatty, admitted to News.com Austrailia that techno cats were already starting to outshine his skills: "I've now realized that with my limited technological prowess I can be out-gunned by a kitten, which I find a bit depressing," Beatty told the News. But I wonder if techno cats would not soon develop problems that human techies get from being hunched over monitors; eye strain, curvature of the spine, mouse paws, etc. This special cat tip came from my colleague Steve Levenstein. Sources include ABC News Austrailia and News.com.au.